I Forgive You Quotes for Him: Forgiveness is a part and parcel of every relationship. Love itself, is built on the foundation of being able to forgive someone you really care about. But just like everything else in life, forgiveness is a bitter pill to swallow. Whether it is your boyfriend or ex – having the heart to overlook someone’s shortcomings for a greater purpose does not come easy. But the good news is that letting go of the past, mistakes that were made and bad memories takes a big emotional burden away from your life. It gives you freedom in a way that you never imagined. Yes, it is easier said than done but you’ll never know until you try. Here are a few inspirational words and messages that’ll hopefully give you an insight into how you can forgive, let go and move on. 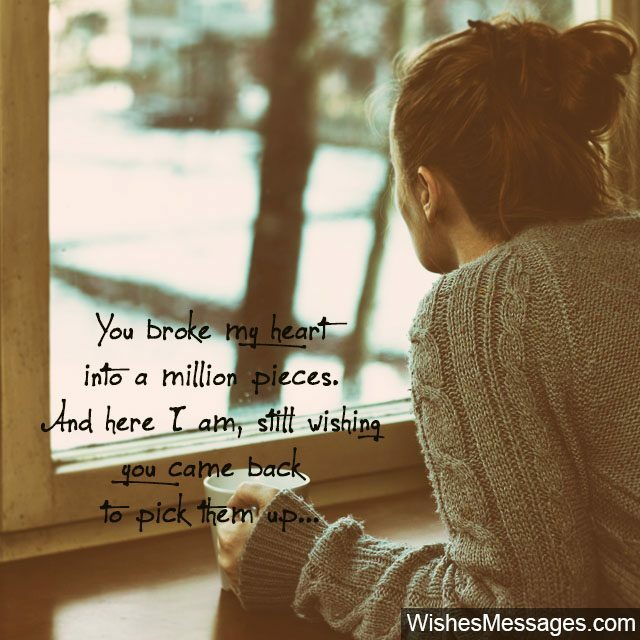 1) How is it that even when you break my heart into a million pieces, I still wish that you were here to pick them up? Please come back baby, I love you and I forgive you. 2) Who you are to me in my life, means a lot more than what you’ve done. I forgive you. 3) You didn’t just lie to me… you broke my trust. I opened my heart and soul and you took that for granted. I don’t know where to begin, but it hurts from within. Things may never be the same between the both of us, but I still want you to know that I’m strong enough to look you in the eyes and forgive you for what you did. I’m not the one to believe in revenge. I’ll let karma do the dirty work. 4) You hurt me in a way that I never would have imagined. But I don’t want to spend the rest of my life hating someone I love from deep down inside my heart. I forgive you. 5) Bitterness is a disease that eats into your soul day after day. Forgiveness is the pill that’ll set you free. As hard as it is, I want to move on and free myself… I forgive you. 6) I forgive you, not because I’m weak but because I’m strong enough to let go of the past. 7) Who you are today matters to me more than who you were before. I forgive you. 8) I forgive you, not because I am ok with what you did, but because I need to move on. 9) I’ll forgive, but I’ll never forget. 10) Sometimes in life, you forgive people because you’d rather have them in your life even after what they did, than to lose them forever. Which is why, I want to forgive you and make things work. 11) Don’t take my forgiveness for granted. There is nothing more vengeful than a heart broken twice. 12) Sometimes the burden of forgiveness is easier to carry than the burden of living life without the person you love. And that’s why, I’m willing to put the past behind. 14) Just because bad things happen, we don’t lose faith in the heavens above. Just because my heart has been broken, I will not stop believe in love. I forgive you. 15) I want to build on what we have, rather than cry over what we don’t. I forgive you. 16) Forgiveness is like the beautiful sunrise that the darkest of nights are forced to give way to. This is my sunrise. 17) It’s a pity that you realized how deep my love is for you and all the sacrifices I was willing to make for our relationship. 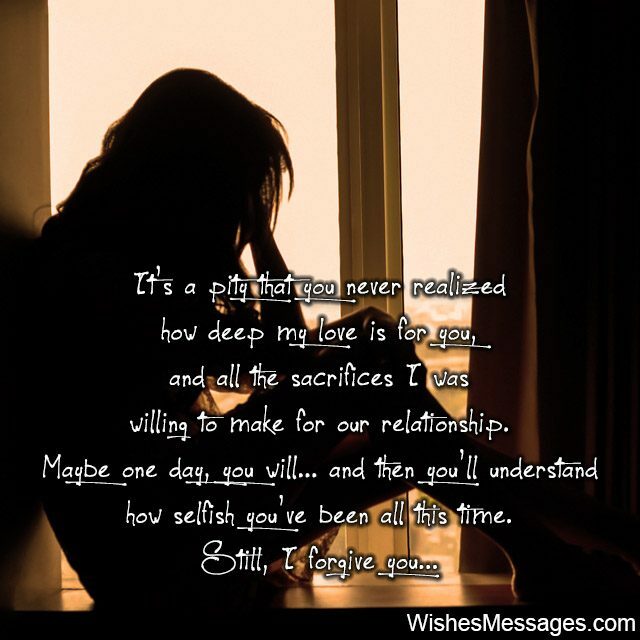 Maybe one day, you will and then you’ll understand how selfish you’ve been all this time. I forgive you. 18) You had the courage to accept your mistake. I have the heart to forgive you. 19) I’m not ok with what you did, but I’m not prepared to destroy what we have. I forgive you. 20) I forgive you, not because I’m gullible, but because I want to give us another chance. I still miss you. 21) Every relationship has faults. The only way to make it stronger is to accept, forgive and move on. 22) It takes common sense to say sorry but it takes a heart to forgive. I love you. 23) I may never forget what happened in the past, but I have the strength to look beyond and forgive, just for the sake of what can happen in the future. 24) Things will never be the same again but that doesn’t mean I’m not willing to try. I forgive you. 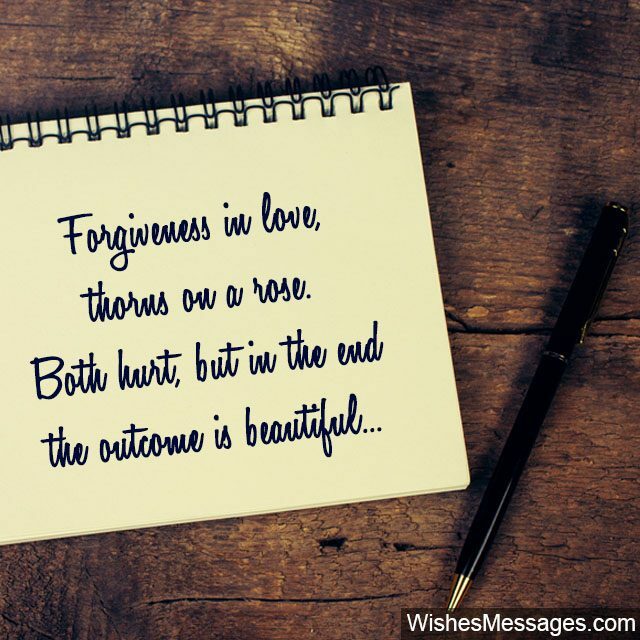 25) Forgiveness in love, thorns on a rose. Both hurt, but in the end the outcome is beautiful. I love you baby. 26) Revenge is for the weak, forgiveness is for the brave. I forgive you. 27) Sometimes, making peace with the past is better than letting hatred ruin the future. 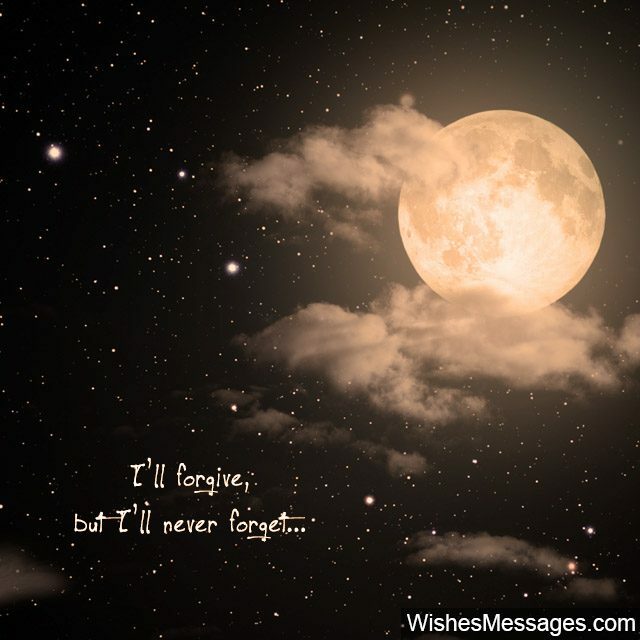 Things may never be the same again, but I’ll never truly move on if I don’t forgive you. 28) I am not going to fight over what’s right and wrong, with the very person who made all my wrongs right. I love you baby. 29) Relationships are about making sacrifices for Love, something that’s far bigger than You and Me. I’m willing to make mine, I forgive you. 30) If you have the courage to say sorry, I have the strength to forgive. I love you. 32) I’d rather have a new beginning than a bitter ending. I forgive you. 33) Every relationship has cracks. 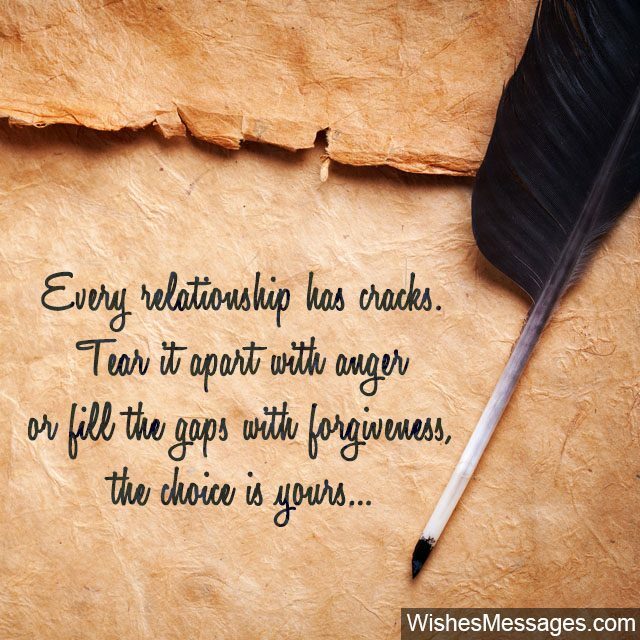 Tear it apart with anger or fill the gaps with forgiveness, the choice is yours. I choose to fill the gaps in ours, I forgive you. 34) It’ll take more than just a few tears for me to walk away… I never knew the real meaning of love until I met you and I’m not letting that go so easily. I forgive you. 35) I can either see you walk away, or hold your hand and walk together… I choose to do the latter. I forgive you. 36) Don’t take my forgiveness for granted. I know how to forgive but I also know how to let go and move on. 37) US, is more important than ME and YOU. I forgive you. 38) Every relationship has its share of fights and arguments. We have ours. I want to embrace all the imperfections in ours, even if that means letting go even when I don’t want to. I forgive you. 39) Forgiveness is one of the pillars that holds a relationship in place. I won’t let ours tumble over silly things. I forgive you.